Montgomery High School is making ‘effective progress’ towards getting out of special measures, Ofsted has said. The positive news follows a difficult week for the school, which saw hundreds of children stay at home on the first day of term after a hoaxer made threats to carry out a massacre at the school. Now, a report from Ofsted said the higher quality teaching, tougher lessons, and better-behaved students have all been credited with helping to turn the Bispham school‘s fortunes around. In a report released on Friday, inspector Mark Williams praised the school, which was rated ‘inadequate’ and ordered to improve by the education watchdog in 2014. Following a visit, he said sponsor Fylde Coast Academy Trust and headteacher Tony Nicholson were ‘clear that only the best is good enough’. The number of pupils who gained five GCSEs, including English and maths, rose from 54 to 56 per cent last year, while youngsters are making better progress because they are being challenged more, Mr Williams said. 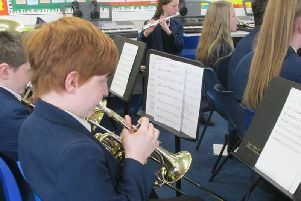 “Pupils were overwhelmingly positive about the school and the improvements they had seen,” he said. To further improve, the school should continue to work on its assessments to offer a greater level of consistency, and carry on pushing its students to achieve more. Montgomery was placed into special measures in 2014 after inspectors criticised ‘inadequate’ teaching, slammed ‘widespread flouting’ of the rules, and said valuable lesson time was being ‘wasted’. But after overhauling its staff – 17 have left since April – bringing in new headteacher Tony Nicholson from the ‘outstanding’ Hodgson Academy in Poulton, and being told ‘only the best is enough’ by sponsor Fylde Coast Academy Trust (FCAT), standards have now improved to the brink of the school leaving special measures. A 54-year-old Blackpool man arrested in connection with threats to carry out a ‘massacre’ at Montgomery has been bailed until April 20. The school has stated ‘categorically’ that he is not a teacher, following rumours on social media.